The tallgrass prairie used to be a vast continuous expanse of habitat harboring diverse populations of plants and animals. 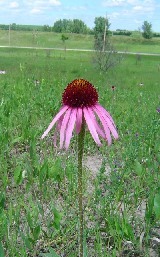 Now prairie habitat exists in small and isolated patches. How long will small remnant populations persist and what can we do to conserve them? To answer this central question in conservation biology requires better understanding of some basic biological processes and how they interact. R esearchers have taken two distinct approaches to understanding population persistence in remnant habitat patches. One approach investigates the ecological dynamics of fragmented landscapes focusing on environmental factors such as lack of fire, disrupted species interactions (e.g. plant-pollinators), colonization of remnants from other remnants, competition with invasive weeds, and demographic stochasticity. Another approach investigates genetic issues experienced by small populations in fragmented habitat, such as loss of genetic diversity by drift, inbreeding depression, genetic swamping from nearby reintroductions, and outbreeding depression in restorations. Rarely does a single investigation account for both genetic and ecological dynamics when modeling the persistence of populations. Bringing the two approaches together. Our overall research approach is to simultaneously investigate ecological and evolutionary processes and how they interact in the same study system. We use experiments, observational studies, and modeling approaches to answer our questions. 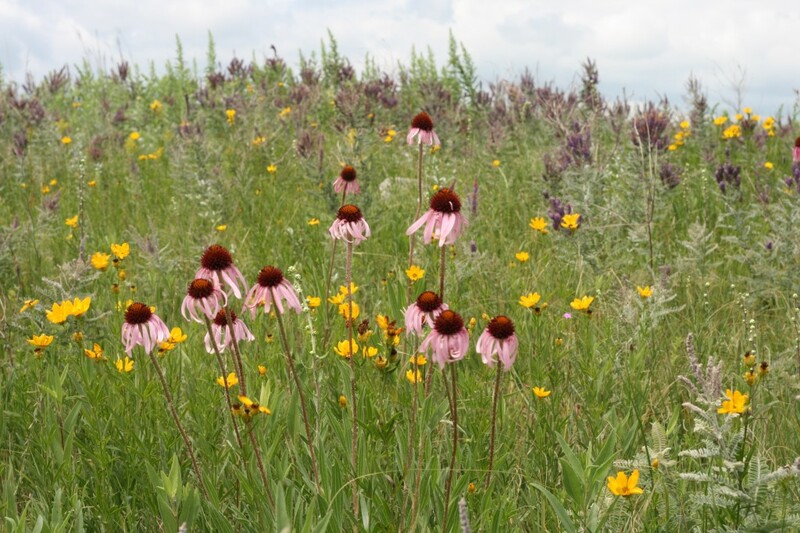 Empirically, we focus on a model study system: a common native prairie plant Echinacea angustifolia (Asteraceae) growing in remnant populations within an agricultural landscape in western Minnesota. This widespread purple coneflower isn’t rare or endangered, but it serves as a good model for prairie plants because it has traits like self-incompatibility and a long lifetime. These traits are well represented in the prairie flora. Contributions to conservation & beyond. The main motivating question of this research project is applied: what can we do to better conserve prairie plants. We plan to generate concrete answers for stewards, managers, practitioners, and policymakers. Our project also addresses some very fundamental research questions and contributes to better basic scientific understanding of biological processes. Another aspect of this project is training scientists for the future. Many motivated beginning scientists have contributed to the project and gained skills and experience useful for their careers through the REU program, summer employment, internships, and as volunteers, students, and collaborators. We also promote conservation and science education among non-scientists through continuing education classes, workshops, and volunteer programs. Contact us if you are interested in joining our team. 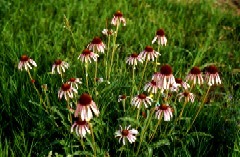 Read about the plant, Echinacea angustifolia. Read about our study site.